Painting projects around your home are some of the easiest, least expensive things that a homeowner can do, in order to improve the appearance, or change the style, within a home. Often when the painting project is completed, there will be leftover paint. Most people decide to keep the leftover paint, instead of disposing of it, because they might decide to paint something else later, or they want to keep it for touch-up instances. If you are trying to figure out the best way to store your leftover paint, then continue reading this passage. We have included some ideas that may help you prolong the life, and the integrity, of your leftover paint. One of the first things to consider, is that paint that has already been opened, can stay usable for about 2 years, if stored properly. You may wish to write the date on your paint can prior to storing. This will take out the “guessing game” that many homeowners play, when they are trying to decide how old their paint really is, and when was the last time they used that particular paint. 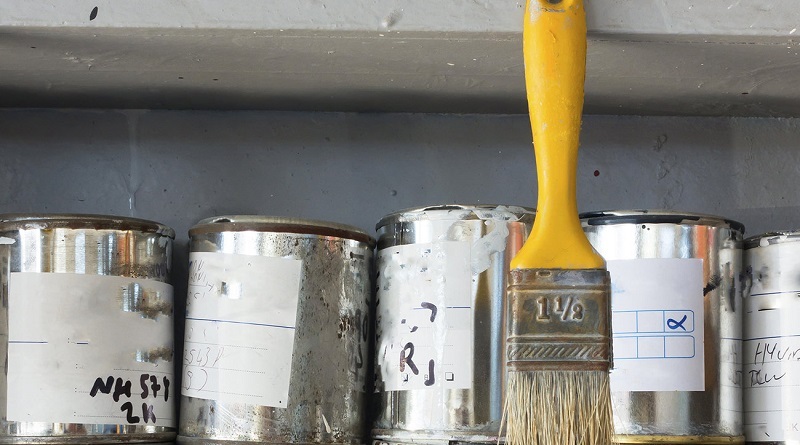 Besides keeping track of the date when the paint was originally used, most people can tell when they open a used can of paint, if the paint has gone bad. Bad paint, that is too old to reuse, will have a very strong, rancid odor. If you have a bad can of paint, it is best to dispose of it properly and invest in some new paint. Paint is best kept in an area that is temperature controlled. This may not be a feasible option within your home, but if it is, then try to store your leftover paint indoors, and in a dark, cool environment. Perhaps you have a utility room or a broom closet that has space for storing some leftover paint. Often, garages or storage sheds become the storage place for leftover paint, but remember, that if the paint becomes too hot or too cold, the integrity of the paint may change, and will make the paint unusable. Lastly, ensure that the paint can is sealed properly before you store it. When an airtight seal is the norm, then the paint will last longer and will remain a good consistency, so you will be able to use it for future paint projects. For any painting project, contact us at Noel Painting.